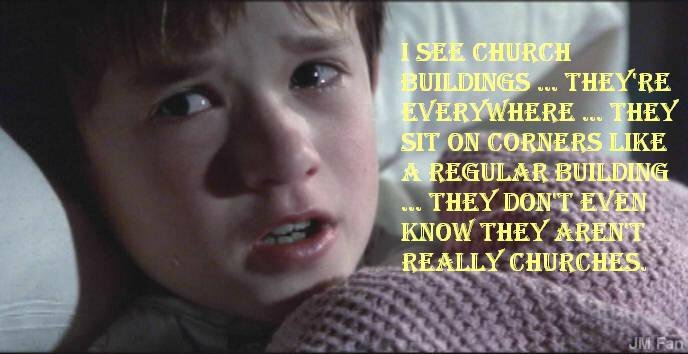 Church Buildings Are Like Ghosts! I absolutely HAD to post this up today! Aside from a good laugh, I see this as one of the greatest tragedies in the history of the church: the fact that most people and many Christians believe the church is a building. Just read a great post on the meaning of the word “church” over on koinoniablog.net. You can read the whole post here. I almost wholeheartedly agree with Bill here, so I thought I would highlight some things I especially appreciated and also take him to task on a couple others. I find this to be a very good point. First of all, this is clearly separatist language. Second, while it does address a historical issue, it clearly avoids a more biblically based definition. Such a definition may correctly reflect a certain theological persuasion, but lacks scriptural merit. Because so many Christians have been culturally conditioned to think of church as either a place to go on Sunday or worse “God’s house/temple” where they can meet him during a worship service. If there is one thing that I believe we need to get straight it is this – the church is a community. I still see a little bit of that Reformation answer in saying that the church gathers on a regular basis “to preach the gospel.” But without further clarification, I can’t say that I wholeheartedly disagree with him. In other words, I don’t believe that every time the church gets together that the gospel must be preached in the form of a sermon. That said, I do believe that the gospel message is more of a natural byproduct or fruit of the church since the basis of their meeting is in Christ and in the life that he provides. This message, then can be shared in many different ways. So, I was quite happy to see that Bill Mounce took this approach, though I am not at all surprised that he did since his specialty is the Greek New Testament. But one does not need to read Greek to pick up the New Testament and see that the church looks quite different there than it does on most Sunday mornings these days. How interesting and convenient that as I was perusing Frank Viola’s blog Reimagining Church that I came across his well-reasoned thoughts on the kingdom vs. church debate. Now, I realize that some may see this as a moot point and others may not even know of the rationale behind it, so I will elaborate just a bit. Basically, some people reason that since Jesus only mentions the church (εκκλεσια) a couple times, but mentions the kingdom (βασιλεια) many times in the gospels, that Jesus’ primary focus was the kingdom and not necessarily the church. Now, while I see the major premise I miss the minor premise entirely. But this is probably why I appreciated so much what Frank had to say, and it caused me to realize that over here on ECS (Early Church Studies) perhaps I should put forth my very general thoughts on the church as seen in the gospels. “Consequently, every time you see the Twelve with Jesus (and the Women) in the Gospels, you’re seeing the church. So, I thought that this is a very nice way to put it – embryonic church. And much like the debate centered around the pro-life/pro-choice movement, I suppose there can be debate over when the church is officially considered to be alive, so to speak. Seems that many place the birth of the church at Pentecost in Acts 2. At least this is where it is most obviously present. But I tend to agree with Frank on this, and have done so, at least subconsciously for some time. Which brings me to the bottom line. The church is indeed present in the gospel accounts, at least implicitly if not explicitly. And this is where much of my current interest lies as I slowly plod through the gospel attributed to Mark…the gospel many believe to be the first widely received by the church. Let’s see what turns up!